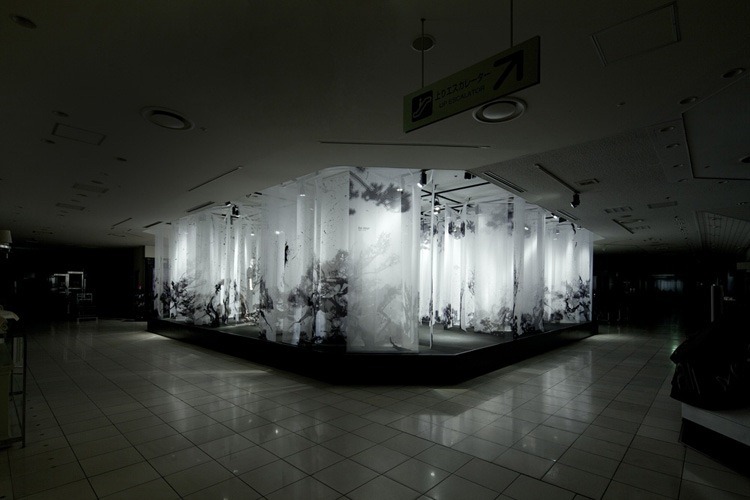 This beautiful retail display is by artless inc, a design and art studio in Tokyo. the display is for Isetan, a Japanese department store, also famed for its beautiful window displays. The display is called The Stage or “Bokusho” and featured in the store over the new year. Particularly in these photographs, the display looks incredible. I do ask what it looks like when all the lights are turned on and wonder how much the display detracts from the clothes it is trying to sell! The layering and translucency of the piece creates an almost ethereal effect. It seems a waste to just use this as a display, the name ‘The Stage’ itself almost suggests that is could have another use, particularly with the way it is lit and the sense of drama it has. It was tough to find any information on this piece but for more images and a short film of the space, head over to the artless blog.